There were mixed results for my afternoon visit to Reffley Reservoir. Some of my favourite creatures are dragonflies and by now there should be some around. They do live at the Reservoir, but not in huge numbers, so it can be like looking for needles in haystacks, particularly with the damselflies, which are just like flying needles. Today, I caught sight of one or two in the tall grass a few feet from the water way. But could I get a decent photo? Very frustratingly, no! The photos improved at the end of the visit! I moved on in the hope I might do better further on. I joined my husband sitting at the side. Eventually, two of the juvenile coots we had been watching over the past few weeks swam into view and we could see they were now developing the coot’s white facial shield. One of them dived under the water briefly to find something to eat. They joined up with a third sibling and an adult later. 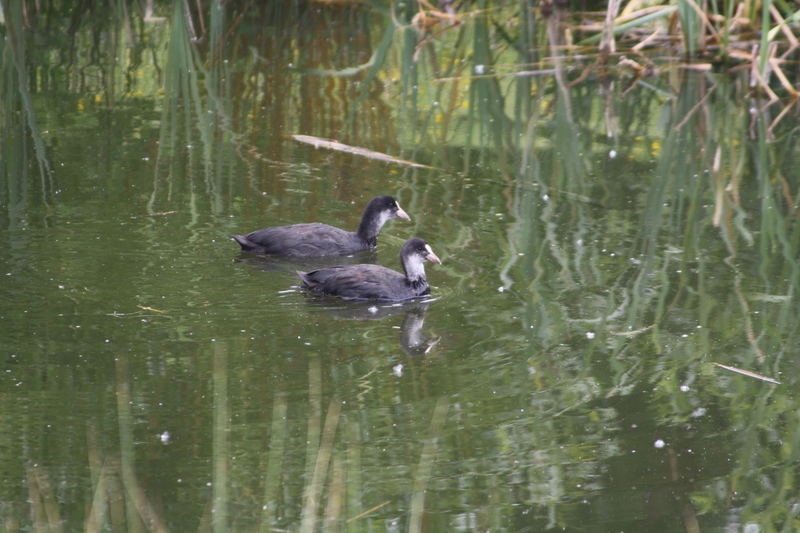 Two of the juvenile coots. At one point, I noticed two or three bluey needles hovering a few inches above the grass just in front of us. Then I saw two of them over the water, close to the bank. Then I lost sight of them and my husband and I started discussing the plants around us.I explained one of the plants, which had a tiny yellow flower, a bit like a clover, was black medic. I am beginning to notice plants a little more and think “oh, I recognise that one”! Maybe I am beginning to learn something from the plant surveying exercise I’ve undertaken with the Norfolk Wildlife Trust?! 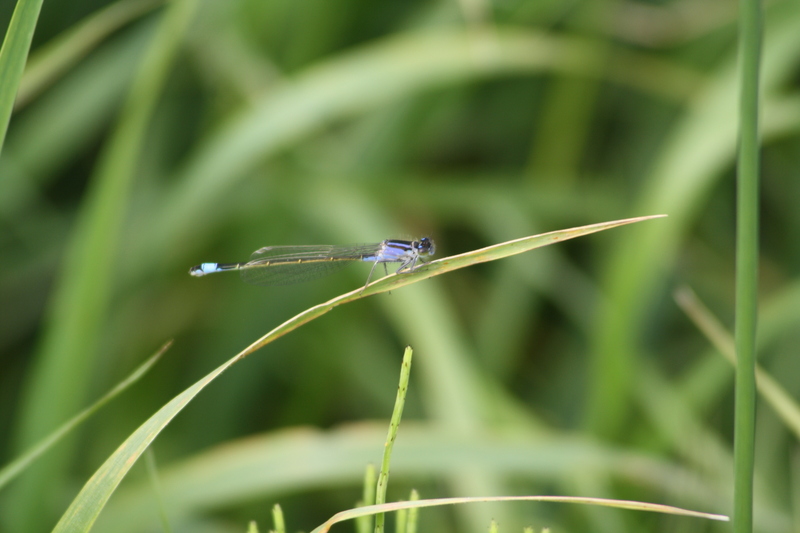 As we left the Reservoir, I walked alongside the grass, watching out for damselflies. 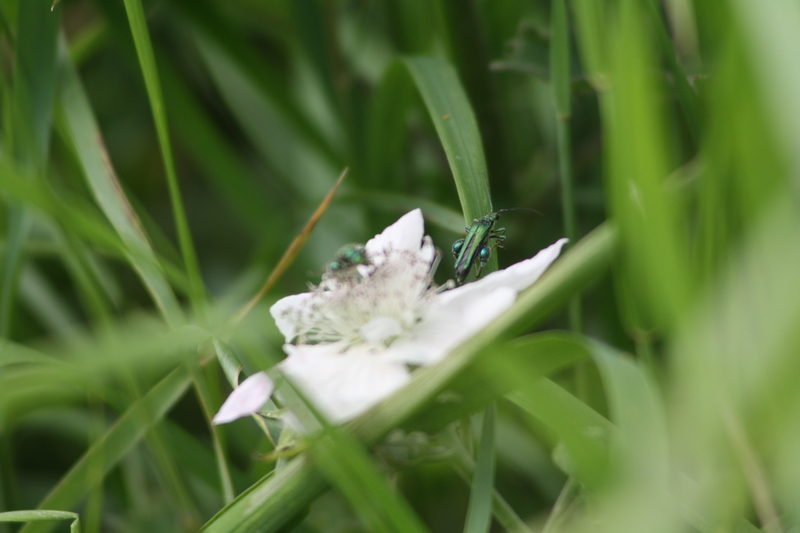 I caught sight of two shiny green swollen thigh beetles feeding from a bramble flower. I tried photographing them, but would have found it easier with another lens! Male swollen thigh beetle on a bramble flower. Eventually, a few more damselflies appeared. Again, I tried to get some photographs. I like to get some pictures to help me identify them and because wherever possible, I try and send details of any sightings to the County Dragonfly Recorder. A chiff chaff sang quite a lot during our hour long visit and we both heard and saw a couple of magpies. The moorhens squawked occasionally from the reeds and there was a quack now and again from the mallards. I think I heard a wren when we first arrived. And a short buzzing call led us to look up to see a couple of swifts high in the sky. And just as we were leaving this wild place to return to the housing estate, a beautiful male orange tip butterfly danced its way along the dyke. Despite the frustrations, at least the damselflies are returning and so shall I another day!